We're using lots of fresh greenery around the house this Christmas. I want to share with you a few Poinsettia varieties we liked at the local nurseries. The two photos above are called "Marble." I love the pink and cream leaves. These are located in our foyer. The red with cream centers (above) are called "Premium Picasso." Of course I couldn't resist them due to their lovely colors and name! These are my favorite, and I have them in our foyer, family room, and kitchen. I only purchased one of these. It is a "Cortez White," and I put it in the art studio. I was intrigued with this variety. Called "Winter Rose Red," they can be cut and placed in a vase. Supposedly they last for weeks. This little beauty is in our powder room. 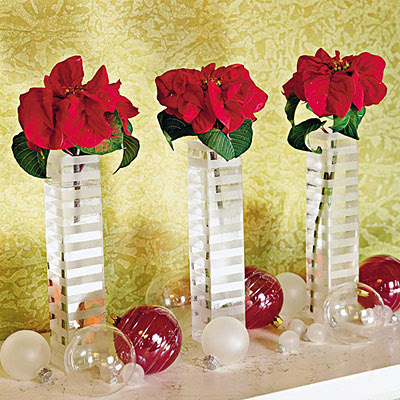 Do you have a favorite Poinsettia variety? Come back tomorrow for more Christmas decor. We have a poinsettia farm near by that has all of these. I purchased the white this year :) It's amazing that there is such of variety. Are you not doing the Happy List for Mamarazzi anymore? We cant do them because of the kitties eating them. Beautiful! I love all the varieties there are of poinsettias. I bought a huge pinkish one at Wal-Mart for only $10. Hi Ricki.. love all the poinsettias that you have shown. I usually buy one large one at Costco. Not this year... I have a small white one. Love the marble variety and also your MacKenzie Childs pots! RJ, they are all so pretty. I love the colors. Finally found a house, but probably won't get to do any Christmas stuff this year! Enjoy. Lovely!! Do you try to keep your Poinsettias after Christmas? Oh they are beautiful! I don't think I've seen the Marble or Winter Rose before. They are all so beautiful and I love your Mackenzie pots! My mother in law always buys a variety of colors! Very pretty Ricki Jill. I have seen some marble in purple and blue the other day. The first time I ever saw marble Poinsettias. Oh ricki! I was,pretending I didn't need/want poinsettias this year...you just totally called my bluff! Those are all very beautiful, Ricki Jill. With my traditional decor and color scheme, I tend to stick to the traditional red poinsettia. A few years ago, there were a ton of the Winter Rose Reds on the market down in Yuma. I thought they were really pretty and bought a couple. Didn't see them again until today at Home Depot. Hmmm.....may have to try one of these again. I love them in your Mackenzie-Childs pots. I would like to find the Winter Rose Red to use in vases. These look lovely in your M-C pots. Unfortunately I can't have these plants because my cat will eat them! Lovely colors. I saw a red/ivory one at my grocery the other day. Some petals were red and others were ivory. It was so cool. I should have brought it home!